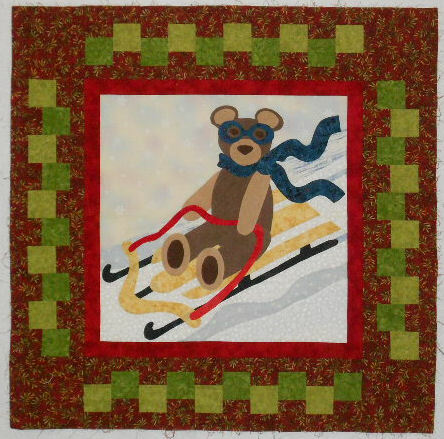 The first two patterns are seasonal applique wallhangings featuring Baxter Bear. He’s a jaunty little bear who loves to have fun. Spring and Summer are here. Fall will eventually be added once it is done and Winter is done but giving me fits at the moment so once I figure out where that elusive inconsistent drawing line is it, too, will be added. 1. Spring in Baxter’s Garden. Here Baxter is tending to his sunflowers among his bird and butterfly friends. It finishes approximately 49″ square. (EQ6)\ UPDATED 12/2010 — This file is no longer available. UPDATED 12/2010 — this file is no longer available. The center of the stars is actually a “cracker” block that is used as a siggy block. 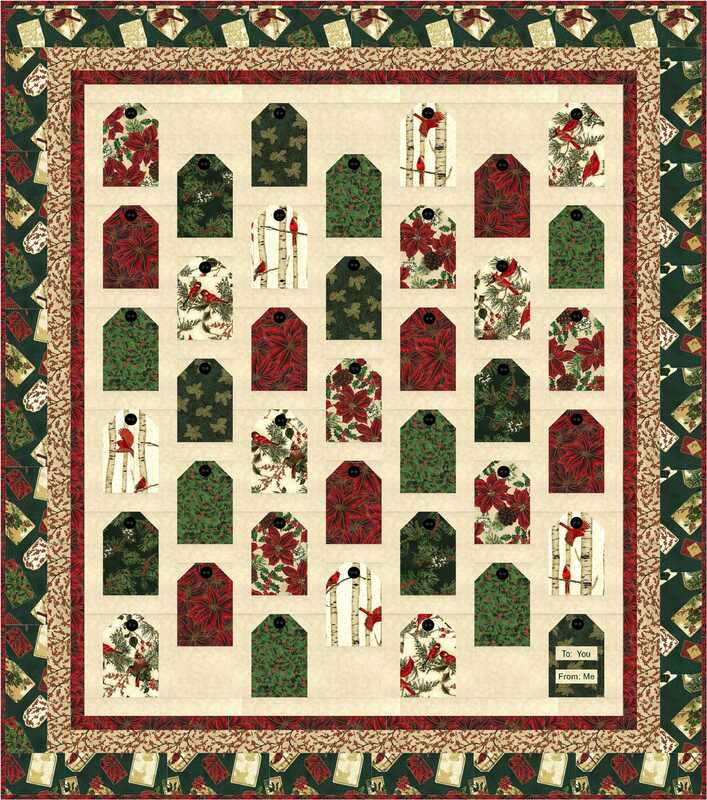 Nine of us made one cracker block, signed it, and we swapped them at a quilt retreat we attended in 2006, “Romp in Texas Hill Country” to swap. We also swapped a FQ of the “colored” fabric we used to make the cracker block along with the block. So I was able to turn my “crackers” into stars and of course it needed those Yellow Roses added to commemorate the retreat. Tools of the Trade (EQ6 – added 7/30/09) This wallhanging was designed several years ago for The Quilting Post online quilt group to celebrate National Quilting Day. It features a few “tools of the trade” used by many quilters — rotary cutter, spools of thread, buttons, pincushion and pins, and yes, that cup of steaming coffee is a must. I fussy cut some chocolate candies from fabric and appliqued them below my coffee cup. My favorite part is the quilting thread and needle appliqued in the outer border — definitely the “big stitch” technique! I also used glass headed beads and silver metallic embroidery floss to add the “pins” to my pincushion. Teapot Bouquet block (EQ6) Added 7/31/09. This block was the center medallion of a design in honor of a friend. Thank you so much for the patterns, however I only have EQ5. Maybe one day I can afford to upgrade or find a friend with the right software to print them out for me. So looking forward to 2012 BOM. Thank you for putting them in .PDF format. Have a great year! You’re welcome. The patterns are always in pdf form when it’s something I’m actually writing up full instructions for. 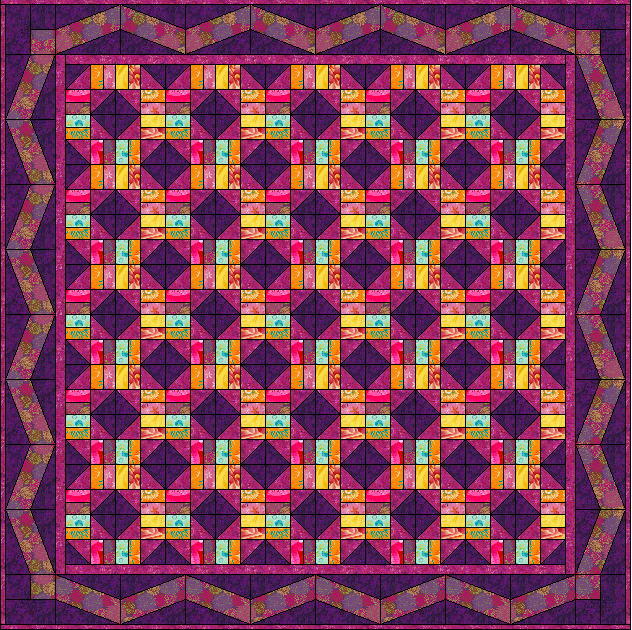 I am looking for a project to publish in our quilt club newsletter. 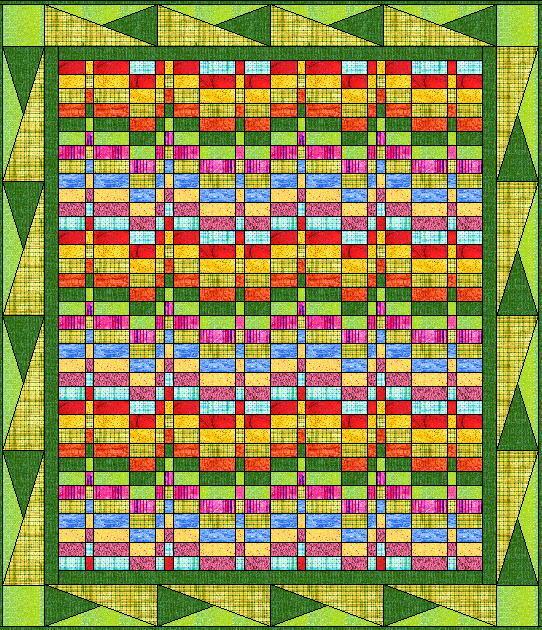 May I use your two beautiful Baxter blocks to make a cot quilt project for our members? I am thinking of publishing it in 8 parts over the remainder of the year. Shall I send you the EQ7 file of my finished project? Thanks a bunch. Awesome work! 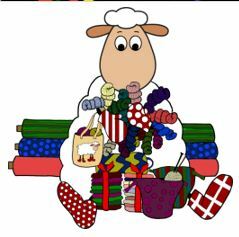 I was wondering if you were going to make your 2011 Wallhangings available in EQ6 or 7 format for download. I for one would love to be able to play around with the colors a little bit to see what effect I would get before making the wallhangings. I’m working with EQ7 today as a matter of fact trying to design a logo. What I have never done before is try to insert text into a block or quilt before. I may have to read up on how to do that. Most of the files were created in EQ6 – only one or two in EQ5. If you had EQ4 and 5 and not EQ6, in order to open them in EQ7, you might be able to open them if you first save them to your computer and then change the file name from .pj6 to .pj7 and resave it. That may let you open it in EQ7. Thank you so much, Denise! I love your designs and look forward to trying them out. Thansk Cindy Jo. Hope you enjoy them. Thanks for the projects! I am totally new to EQ (just loaded EQ7) and was able to download several of your projects to help me get started. The only problem is to figure out which quilt to do first! Thanks again! Someday I hope to ‘pay it forward’ and learn to post eq files for others to enjoy too! You’re welcome Kim! I’m anxiously awaiting delivery of my EQ7 upgrade! I just loaded a tutorial on how to upload EQ files to a blog which may prove helpful when you want to give it a try. It’s in the right sidebar under the EQ upload listings. Love these little bears, and can’t wait to try them. Thanks! I’m glad you like them Vickie! I’ve got a winter version of him that’s still giving me some problems I’ve got to look at before I post him mand I hae one season left to draw. Thank you for the freebies. They are great! You’re welcome – glad you like them! Sorry Christine – that’s one book I want to hang on to. Good luck with your search. Hi – new to your blog but loving it!! I am having trouble downloading the EQ files. I have EQ6 and I clicked on Rippling Rainbow but the EQ file is blank???? Help??? Deb – thanks for visiting! and for letting me know about the problem file. Not sure what’s up since my original doesn’t give me the notecard error. I’ve marked it temporarily unavailable while I try to figure out what the problem is. I’ll post it with a revised date once I get it solved. There are some wonderful designs here! Morning! 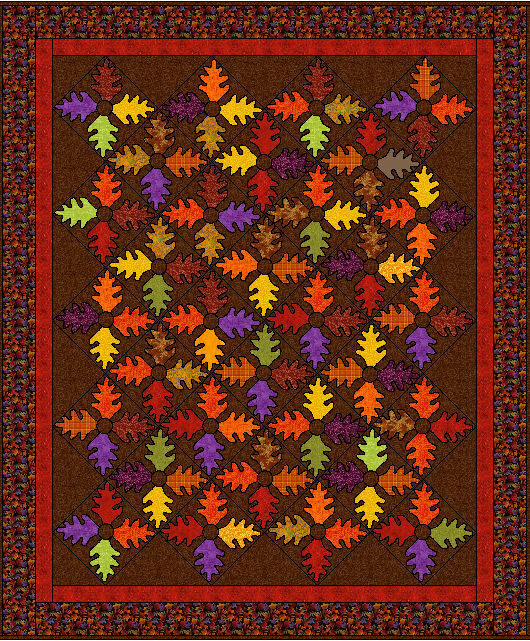 I was wondering if you planned on posting your Fall Bounty from the Nature’s Best Quilt Contest. I LOVE it and I know my mother would as well. Thank you Emily – that one is one of my favorites. I don’t know if the EQ file will get loaded but I may offer it next fall as a sew along project since that one is actually a pattern I wrote up all the directions for. Thank you so much for sharing these wonderful designs! Denise, i just discovered your adorable patterns. What a great baby gift the bear(s) will make. Thank you for sharing your creativity. Thanks Jacque. Glad you like them! Great projects Denise! You are *very* generous in offering to share your projects with other EQ Users. They represent a great amount of time and expertise on your part, and I appreciate your offer to let others have fun with them. are ya gonna share how you did this?? ?